Easier Way to Make PIP videos. Make effects bound up with clips on main video track. The truth is that adding watermark to your video is one of the things that you can do in order to firmly enhance its appearance or protect your work from pirate. In this particular article, we are going to show you how to add a basic watermark which is structured upon text. 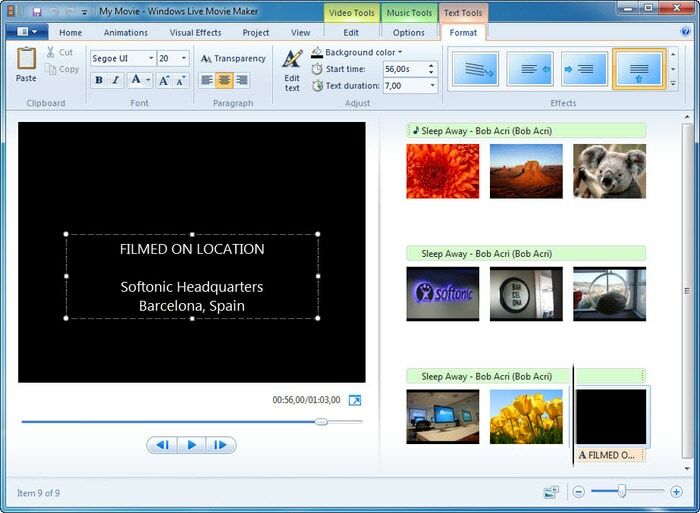 Furthermore, we will also show you how to add image or log using the software of Windows Movie Maker. If you want to go ahead and add a simple text as a watermark and not a logo, you can easily get started with one of the built-in Titles which are available. The first thing you would have to do is start the software and go to Videos under the left Import sidebar. Then you want to properly drag the video on to the timeline and click on the Title and credits button under the Edit section. Then click on Title on the selected clip. Once you are through, you will get a window to type in your username or whatever other text that you want to appear as the watermark there. Click on the animation button and go for the Subtitle so that you can overlay it. The software is particularly comprehensive, and you can easily position the watermark wherever you find suitable. You can also change both the size and the color as you find fit. It's more difficult to add image watermark to your video with Windows Movie Maker, you have to use a plugin and it asks Windows XP or Vista, so it seems pretty hard to add image watermark with Windows Movie Make. Fortunately for you, there is a really easier way for you to add image watermark/logo to you video. All you have to do is download Wondershare Filmora. This particular software is going to allow you to easily do all of the above in just a few quick steps. Below are the steps that to add an image watermark wiht Filmora. Check this video to learn more. If you have download it, open it. Click IMPORT > Imoprt Media Files. Or you can just drag video file to Filmora. Click ELEMENTS in the toolbar. Just choose a image that you like, and then drag it to timeline. You will find there is a image in the preview window. You can reposition and resize it in the preview window. After you are happy with the result, click Export. You can choose different exporting devices and formats. Or directly uploading it to YouTube is also availale. After reading this article, we are sure you will know how to make text watermark by Windows Movie Maker with a few steps. About image watermark, Filmora is the best solution. Check the video below to learn more.